Club rides vary in terms of pace, distance and regroups, which is summarized by the notation example: C/35/Frequent or a ride at a C pace that is 35 miles with frequent regroups. The Ride Classification System is designed to help you choose rides that fit your ability and fitness level. All riders are responsible for choosing rides for which they can maintain the designated pace for the distance specified. Camaraderie, group cohesiveness, safety, and enjoyment are all improved when we are able to maintain the pace. Pace is an estimate of the average speed the ride will travel measured in miles per hour. At any given moment the actual pace will vary depending on a number of factors such as terrain, distance, group dynamics, road conditions and whatever may happen along the way. Our pace levels are presented in a table and a graph to help riders find their correct pace range. A, B, C, D & E represent the different pace categories, A is the slowest ride category, E the fastest. Even the "fast" E category, would be considered a recovery pace by a racer. We recommend that riders conservatively choose a slower pace range to start, and then adjust as experience and common sense indicate. Remember that appropriate pace levels can fluctuate for an individual depending on their current fitness level. Measure your average speed over an entire ride with a distance of at least 30 miles (20 miles for A/B riders). The Twin Bridges Scenic Bikeway is a good ride for this Method. A measurement of average speed does not include time when you are not moving. For example, don't include time stopped at intersections, regroups, or stops for emergencies or mechanicals. Average speeds for an individual will be higher for a flat ride, and lower for a ride with more climbing, everything else being equal. Distance is given in miles, provided directly from the Ride With GPS route. 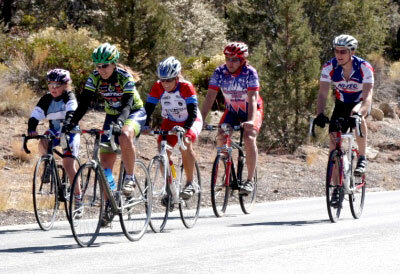 Club rides typically include regroups and stops at pre-designated spots along the route. Examples include junctions, large pullouts, parks, coffee shops, bakeries and stores. Regroups provide an opportunity to keep the group together, get food and water and use local amenities. Stops and regroups are listed on the route slip or communicated by the ride leader before the ride. B-C/20/Frequent Ride at a B or C pace; 20 miles with frequent regroups. Often these are out and back routes, so everyone can ride at their own pace.